Reading and share top 20 famous quotes and sayings about Allegorical by famous authors and people. 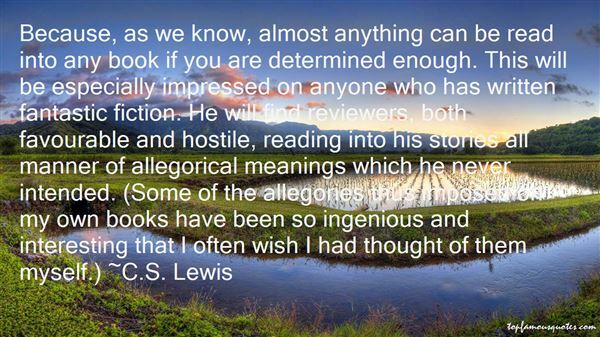 Browse top 20 famous quotes and sayings about Allegorical by most favorite authors. 1. "Sun-worship and pure forms of nature-worship were, in their day, noble religions, highly allegorical but full of profound truth and knowledge." 2. "When you kill somebody in the movies, it matters, whereas in literature it can be allegorical." 3. "Nowhere in Chaucer do we find what can be called a radically allegorical poem." 4. "Because, as we know, almost anything can be read into any book if you are determined enough. This will be especially impressed on anyone who has written fantastic fiction. He will find reviewers, both favourable and hostile, reading into his stories all manner of allegorical meanings which he never intended. (Some of the allegories thus imposed on my own books have been so ingenious and interesting that I often wish I had thought of them myself.)" 5. "First, however, I must deal with the matter of Jesus, the so-called savior, who not long ago taught new doctrines and was thought to be a son of God. This savior, I shall attempt to show, deceived many and caused them to accept a form of belief harmful to the well-being of mankind. Taking its root in the lower classes, the religion continues to spread among the vulgar: nay, one can even say it spreads because of its vulgarity and the illiteracy of its adherents. And while there are a few moderate, reasonable, and intelligent people who interpret its beliefs allegorically, yet it thrives in its purer form among the ignorant." 6. "Fantasy and science fiction can be literal as well as allegorical and there's nothing wrong with enjoying a monster like a giant squid for what it is, as well as searching for metaphor." 7. "Allegorical stories of saints battling with giants, monsters and demons may be interpreted as symbolizing the Christian's fight against paganism. At Bwlch Rhiwfelen (Denbigh) St Collen fought and killed a cannibal giantess, afterwards washing away the blood-stains in a well later known as Ffynnon Gollen. In Ireland, the tales of saints slaying giant serpents may have the same meaning; alternatively they (or some of them) may refer to early sightings of genuine water monsters. St Barry banished a serpent from a mountain into Lough Lagan (Roscommon), and a holy well sprang up where the saint's knee touched the ground." 8. "Now whatever the origin of this apparently meaningless jumble of ideas may have been, it is really a perfect and very slightly allegorical expression of the actual present views we hold today." 9. "Kessler depicts his developing intimacy with a handful of dairy goats and offers an enviable glimpse of the pastoral good life. Yet he also cautions, "Wherever the notion of paradise exists, so does the idea that it was lost. Paradise is always in the past." The title Goat Song is a literal rendering of the Greek word traghoudhia, tragedy. Reading it, I was reminded of Leo Marx's analysis of Thoreau's Walden. In The Machine in the Garden, Marx names Thoreau a tragic, if complex pastoralist. After failing to make an agrarian living raising beans for commercial trade (although his intent was always more allegorical than pecuniary), Thoreau ends Walden by replacing the pastoral idea where it originated: in literature. Paradise, Marx concludes, is not ultimately to be found at Walden Pond; it is to be found in the pages of Walden." 10. "I woke up, smiling to myself at this dream with its allegorical aspects but with no real meaning." 11. "Among the many problems with taking the Bible literally is it reduces the most mysterious and complex of realities to simple - even simplistic - terms. Yes, scripture speaks of fire and damnation and eternal bliss, but the Bible is the product of human hands and hearts, and much of the imagery is allegorical, not meteorological." 12. "Saint Augustine … insisted that scripture taught nothing but charity. Whatever the biblical author may have intended, any passage that seemed to preach hatred and was not conducive to love must be interpreted allegorically and made to speak of charity." 13. "We are all the spirit sons and daughters of a loving God who is our Father. We are part of His family. He is not a father in some allegorical or poetic sense. He is literally the Father of our spirits. He cares for each one of us. Though this world has a way of diminishing and demeaning men and women, the reality is we are all of royal, divine lineage. In that unprecedented appearance of the Father and the Son in the Sacred Grove, the very first word spoken by the Father of us all was the personal name of Joseph. Such is our Father's personal relationship with each of us. He knows our names and yearns for us to become worthy to return to live with Him." 14. 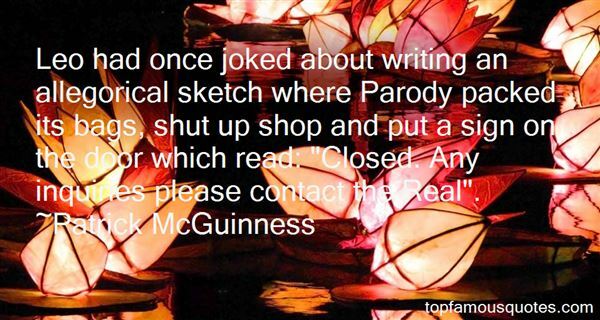 "Leo had once joked about writing an allegorical sketch where Parody packed its bags, shut up shop and put a sign on the door which read: "Closed. Any inquiries please contact the Real"." 15. "Hence all original religions are allegorical, or susceptible of allegory, and, like Janus, have a double face of false and true"
16. "Human beings across every culture I know about require such stories, stories with cool winds and wood smoke. They speak to something deep within us, the capacity to conceptualize, objectify and find patterns, thereby to create the flow of events and perceptions that find perfect expression in fiction. We are built this way, we create stories by reflex, unstoppably. But this elegant system really works best when the elements of the emerging story, whether is is being written or being read, are taken as literal fact. Almost always, to respond to the particulars of the fantastic as if they were metaphorical or allegorical is to drain them of vitality." 17. "Many poets in Iran have learned to speak almost a secret language, where political issues are talked about in allegorical ways." 18. "Q.Do you have any positive message, in your opinion?A.Indeed I do think that I do.Q.Such as what?A.The crying, almost screaming, need of a great worldwide human effort to know ourselves and each other a great deal better, well enough to concede that no man has a monopoly on right or virtue any more than any man has a corner on duplicity and evil and so forth. 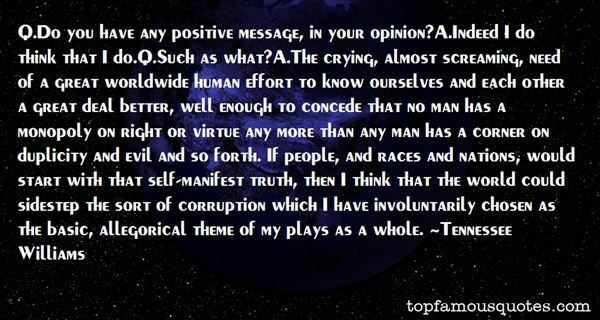 If people, and races and nations, would start with that self-manifest truth, then I think that the world could sidestep the sort of corruption which I have involuntarily chosen as the basic, allegorical theme of my plays as a whole." 19. "In order to get over the ethical difficulties presented by the naive naturalism of many parts of those Scriptures, in the divine authority of which he firmly believed, Philo borrowed from the Stoics (who had been in like straits in respect of Greek mythology), that great Excalibur which they had forged with infinite pains and skill—the method of allegorical interpretation. This mighty 'two-handed engine at the door' of the theologian is warranted to make a speedy end of any and every moral or intellectual difficulty, by showing that, taken allegorically or, as it is otherwise said, 'poetically' or, 'in a spiritual sense,' the plainest words mean whatever a pious interpreter desires they should mean." 20. "But if it not be true, the myth itself requires to be explained, and every principle of philosophy and common sense demand that the explanation be sought, not in arbitrary allegorical categories, but in the actual facts of ritual or religious custom to which the myth attaches." Thinking aloud is a habit which is responsible for most of mankind's misery."